Guernsey men are through to the quarter-finals of the EH National Trophy, but the island's women have been knocked out in the third round. The men beat Maidstone 5-3 as they aim for a fifth successive final, while the women went down 3-1 to Bishop's Stortford at Footes Lane. 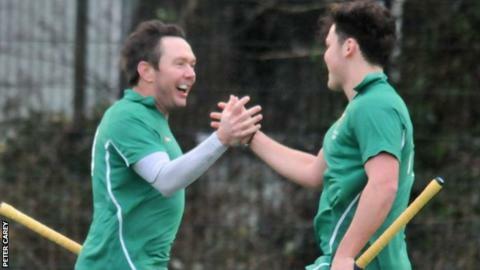 "We weren't quite as slick as can be," said men's player-coach Andy Whalley. "On another day we could have scored eight, nine or 10, it was just the final pass in the 25 was a bit awry." He added to BBC Radio Guernsey: "But we've got another three weeks to work on that and then the games come thick and fast." It was the third year that Guernsey's women had played in the National Trophy, having made the final in 2014 and losing in the first round last season. "It seemed like they wanted it a little bit more, they were just quicker than us," said captain Gemma Piercey. "They closed the ball down quicker. We didn't have much time on the ball, we found that they were on us straight away, so a lot of our passes were cut out. "All of their goals came from short corners, so no goals from open play, which is a good thing to support us. "We switched on in the second half and we wanted it, but we left it a little bit late."